Hi everyone! Yay! 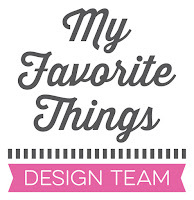 It’s time for the My Favorite Things August product launch! Today, you can see all new products and they are available right now on the MFT online store! Most of the supplies I used for this project are linked in the list at the bottom of this post. This girl could be me in the past, with my old red phone (this happened to me all the time with the cord). The patterned paper is from the newest Party Patterns paper pack. I also used the newest speech bubbles from the Essential Speech Bubbles Die-namics set. As I needed a smaller bubble, I just cut the excess off :-). I masked the phone cord on the stamp and created a new cord using black hemp cord! What a delightful card! You always have just the right extra touch. This is the cutest card! Love the wire around her legs!! Love your card. The little girl is so cute. Adorable! This is such a sweet and wonderful card! Thank you!! Fun card! I love how the cord is wrapped around her! This card could so be me in the 70's, cord and all. LOL Love it! Adorable card! I remember those days also! Couldn't go far with those cords! Your card is wonderful! Adorable...I love the telephone cord around PI's legs! She is too cute!! Love how the design focus is on her!!! How cute. I like your coloring and striped background. Too cute. What a fun card. Love it. It's an adorable card and did an awesome job on the jeans coloring !!! Such a sweet card. It made me smile. How adorable! Love the way she is tangled in the phone cord, very clever little detail for big impact! TFS Francine! Cute as can be! Love the telephone cord detail! She is so adorable. Beautiful coloring. Oh, this is so cute! Love what you did with the cord! It's so nice to see that if you give this girl different colors, she looks very different. I saw her at another blog with blond haar: totaly different. Your card is beautiful! So cool and stinkin cute!!! Thanks for sharing ! This is so cute! Love the cord wrapped around her legs. What a fun detail! So cute! I love the cord around her legs! Clever addition of a telephone cord! She's a doll and you colored her so beautifully. Gorgeous card. So cute, the cord is a cool detail! Very nice card, I agree the cord is a great idea! She is just adorable! Love this sweet, sweet, card. too darn cute... love the way you wrapped the phone cord around her legs!! Super cute and creative with the cord wrapped around her legs!! This little girl tugs at my heart every time. Love your card. Totally adorable!I love what you did with the cord!So creative! Love this new PI set and your card is so cute. Very cute! I love that the phone cord is wrapped around her legs! Absolutely ADORABLE card, Francine! I love how you wrapped the telephone cord around her leg...so clever and fun! Beautiful Copic coloring, too...as always! Awesome card! Love the cord! Fabulous release! Great fun and lovely colouring! Such a cute idea with the phone and cord. Beautifully made and lovely stamp. Pure I is so cute used this way on your card. Oh, my goodness!! This is so adorable! I love how you created the phone cord, so fun! And your coloring is amazing! LOVE your card! Your coloring is gorgeous and I love how you did the pants! Such a cute idea to create a phone cord for this cute chatty girl. What a fun touch with the twine phone cord, oh my goodness! Love this card! Adorable little girl! The phone cord looks awesome! I love the cord wrapped around the legs! So clever and such a giggle! Such a sweet card! I love the phone cord wrapped around her legs, such a throwback. Oh I LOVE how you colored her & the blue stripey background paper!! And it's hilarious & so perfect that you wrapped the phone cord around her legs!! Such a cute design. Love the phone cord detail. Super cute card! Fantastic paired with the striped background. Cute anecdote about you. Very nice card. adorable card- love the retro phone. Cute card. Love pure innocence and this release.